This weed blooms in August but causes allergic symptoms well into September and October, until the first freeze kills the plant. Approximately 75 percent of people who suffer springtime allergies will also be affected by ragweed pollen, according to the Asthma and Allergy Foundation of America. Monitor the local pollen count, stay indoors as much as possible, especially during peak hours (usually mid-morning to early afternoon), keep home and car windows completely closed, vacuum carpets and upholstery regularly, wash your clothes, linens, and curtains regularly. Also, bathe your pets frequently as they can carry the pollen into the home. Mold and mildew thrive in damp areas such as basements, kitchens, and bathrooms. Even though they aren’t killed by the first frost, they do tend to go into a dormant phase during the winter months. Rake your yard of fallen leaves and remove leaves from gutters. Don’t leave piles of leaves in your yard. Use a dehumidifier in the house, especially in the basement. Air should be between 35 and 50 percent humidity. Clean bathrooms and the kitchen regularly using anti-mildew agents to avoid buildup. Dust mites are a common year-round allergen that thrives in temperatures ranging from the 60s to mid-70s. Dust mites usually die in extreme temperatures or if the humidity drops below 70 percent. Dust mites are hard to get rid of but they usually die in extreme temperatures or if the humidity drops below 70 percent. Use a dehumidifier to keep the air below 50 percent humidity. Up to 40 percent of people with seasonal allergies also have pet allergies. Pet allergies are triggered by an extra-sensitive immune system reacting to dander, fur, saliva, or urine from pets. Avoid contact with furry pets, especially cats and dogs, if you have known allergies. Wash and groom pets regularly. Consider only allowing pets in specific areas of the home and keep them off furniture. Keep litter boxes and pet bedding away from air vents, and use an air purifier to help clean the air of pet allergens. If you think you may be suffering from fall allergies and these tips are still not working, please contact us today. We have options that can help you. We treat adults and children and have 13 convenient office locations so we can see you quickly. Call us or simply click the button below to schedule an appointment. 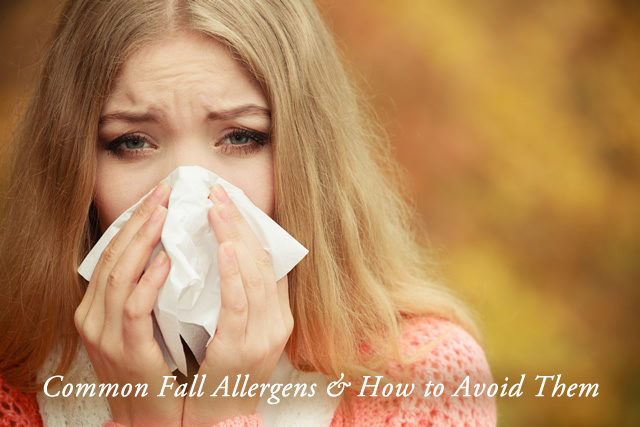 If you would like to discuss issues regarding common fall allergies and how to avoid them, please contact us by clicking below.